Contact us today for ANY & ALL of your construction projects! Great buildings start with great foundations, so start by hiring a concrete contractor with a great track record. 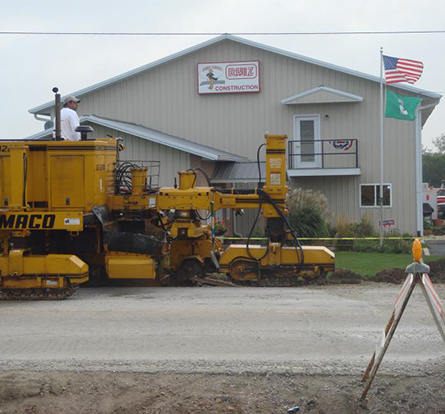 Ruiz Construction performs concrete work for construction projects throughout North Central Illinois. Our clients include industrial, commercial, and residential developers as well as city, county, and state government departments. You can rest assured of our commitment to your satisfaction; no job is too big or too small for our team. Contact us today to discuss your next project. Ruiz Construction Company, in Ottawa Illinois, was founded in 1984 by Michael Ruiz who brought a rebellious and hard-working spirit to the North Central Illinois Concrete Construction Market. Our owner, Michael Ruiz, is also president of the Illinois Valley Contractors Association. Michael's son, Jonathan Ruiz, is our assistant manager. Our construction company is dedicated to breaking the ground of North Central Illinois to transform it to meet the dreams of our customers. As a family business, we are proud of our reputation and we work hard every day to deliver exceptional service to our clients. Our dedicated and experienced team pays close attention to detail and always goes the extra mile to ensure great results. Our team of loyal, talented tradesman and valuable office staff are always avalable to deliver exceptional services and products to our customers. Breaking the ground of North Central Illinois to transform it into the dreams of its customers.